Always looking for items from the The Brown Derby, if you have ANY interior items, caricatures, wall sconces, table ware, furniture, etc… please contact me. In the summer of 1973 I had a memorable lunch with my then nine year old son at the Brown Derby that looked like a brown derby–think it was on Wilshire Blvd. I had a delicious Lamb Pot Pie, but can’t remember what my son had. 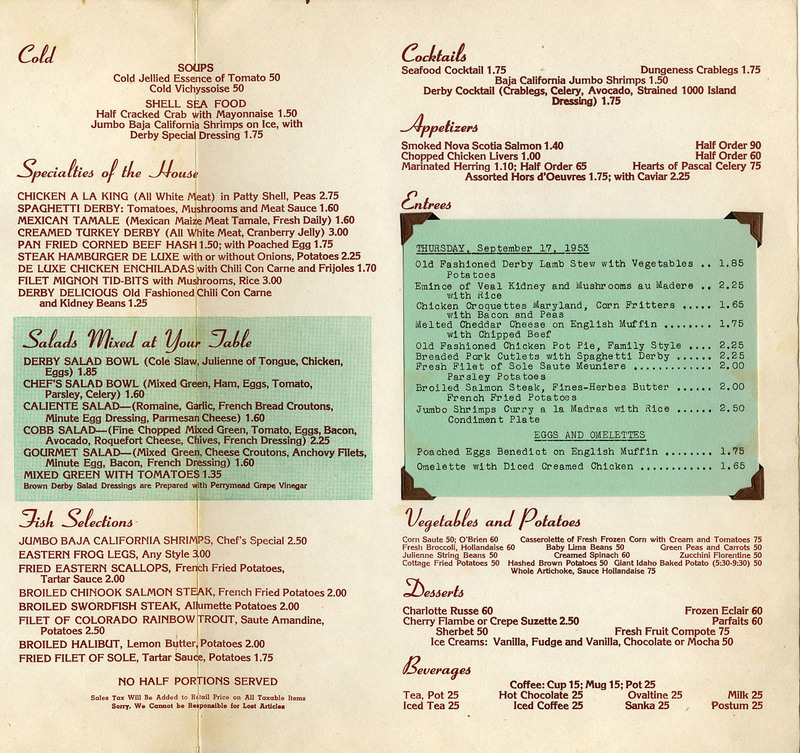 Does anyone have a lunch menu from this restaurant from 1973 or so? It might refresh my memory. I have been searching for the crabmeat (& shrimp ?) appetizer recipe that the Derby served. Can anyone help….please. Always looking for items from The Brown Derby. If you have any please leave a reply. Thank you. I used to have dinner two or three times a week at the Hollywood and Vine Restaurant back in 1969-1972 after my acting classes at Theater of Arts on Wilshire Blvd. Tony was the best waiter ever ! I would always order the infamous Grapefruit Cake for desert. What Great memories of my youth ! Most delicious breakfast, salmon benedict, poached eggs cooked perfect, hollandaise creamy and just enough lemon. Got a jalapeño, cheddar, bacon scone to go, moist the best ever. Can’t wait to go back. In 1961 after graduating from CSULA I went to work in Hollywood and the guys I worked with introduced me to Michael’s restaurant which was at the old Brown Derby Los Feliz location. At the time they had the most unbelievable $1.25 luncheon specials. My favorite was the Shrimp Louie. They also introduced me to El Coyote (if you are REALLY hungry order the Spanish omelet), and El Cholo on Western. Ask to be seated in the back by the fountain. Hi I’m looking for a recipe for the crab appetizer that used to be on the menu in the 80’s and 90’s. it was served in a small foil cup like would hold a small pie or tart. Sort of like crab meat au gratin. It might have been a side dish to the prime rib dinner. Thanks to anyone who can help! The restaurant in Arcadia is just The Derby – no Brown. I believe it was named after the type of horse race by it’s original jockey owners, not after men’s headwear. There is a Brown Derby in Arcadia CA, on Huntington Drive, somewhat near Santa Anita Race Track. Been there for years. If you have something you think should be on this site, send it to [email protected]. Thanks! I would like to share it.I don’t know how. ? Thank you for the recipe, Stephanie! I have an original dinner plate from the Brown Derby, is it worth anything? 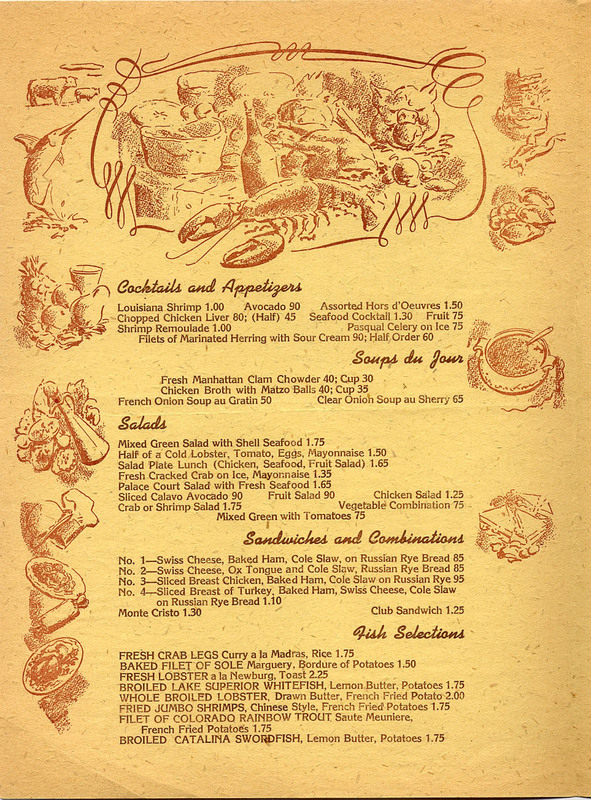 Recently found a 1947 luncheon menu from the Brown Derby. Has a map on the front showing the location of the restaurant and various Hollywood landmarks. Jumbo shrimp cocktail was $1.20 !!! Does this menu have any value? Thinking of putting it on eBay. Thanks. Hello, I am looking for info on my great uncle whom I ‘m told was a chef at the Brown Derby for many many years. (not sure of the location) His name was Louis Joseph Pertuit from Houma La. He lived 812 S Westlake Drive in Los Angeles . He died in 1970 Any info you have would be greatly appreciated. do you by any chance know who the chefs were at the brown derby my grandma told me and my father said that my grandfather was a chef there,they said he was a big man and used to say women have no place in the kitchen! lol! My great Uncle was the maitre D at the Brown Derby and whatever he left behind I now obtain. A couple signatures from celebrities that time and a lot I bar equipment with the brown derby emblem. I collect what I can and loved hearing everyone’s stories about this Hollywood icon. To Peggy: If I had them, I would. 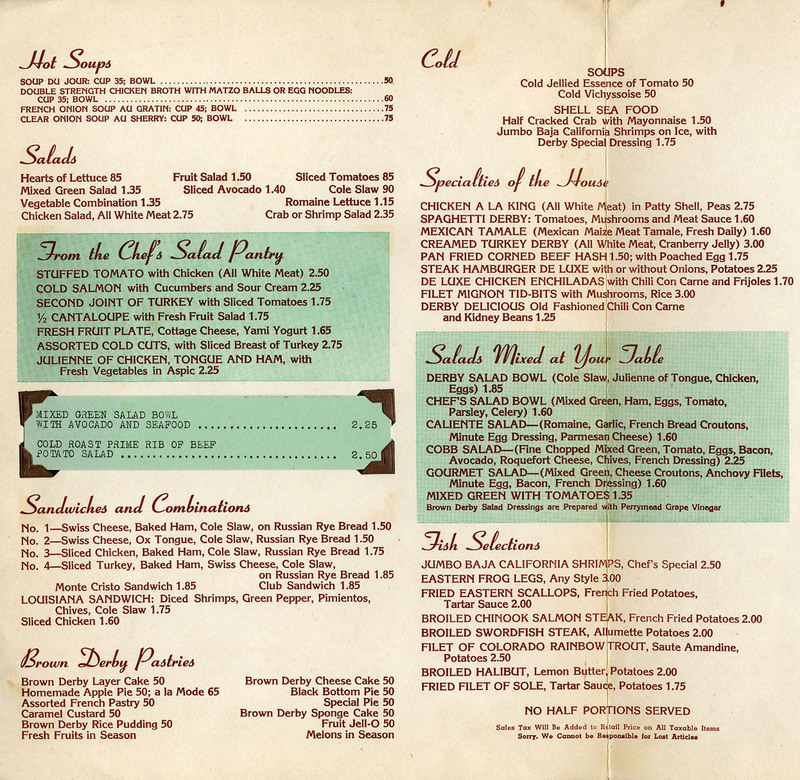 Would you please post a menu from the Brown Derby from the 40’s, 50’s, 60’s and 70’s. after helping me to be able to Create ACU or Advertising Creativity Unlimited USA now a .com Co. in Northern California. Verner H. Seabury introduced me to the Brown Derby. I was told he passed playing cards with friends at The Brown Derby in Hollywood in 1978. Where he could be found on Wednesday nights, He bought me lunch there in 1975, I will never forget that day or his teaching me the Promotions Industry Inside Out. Thanks Verner. Thanks to to The Brown Derby for The Great Memories. I was born in L.A.CA.& remember so many wonderful restaurants & clubs. We’ve lived in Beverly Hills for 50 years & we especially enjoyed dining in the “actual hat” of the Brown Derby on the corner of Rodeo & Wilshire. was Wil Wrights for the best hot fudge sundae ever! The Brown Derby was one of those restaurants that was great for dates in the sixties. The food was so good, and reasonably priced. We also went for lunch there when I started working in the area of Wilshire. But I have one memory that stands out – I was attending a seminar at IBM on Wilshire, and it was three days long. The instructor promised a treat for us at the end of the three days, and the treat was going across the street to the Brown Derby for dinner. The most remarkable waitress worked there at the time, and he told us she would remember everyone’s drink without ever writing it down. We didn’t quite believe this, as there were thirty of us in the class…..but sure enough, that last day of class we went over there and this waitress took all of our drink orders without writing a single thing down, and then brought everyone the right drink!! And refills were also brought by memory. We thought this quite amazing!! I was young and stupid and didn’t want to “bother her” so I wasn’t as attentive to her reaching out to be friends. We’d meet for drinks or coffee every couple of months until she died. Her daughter came into the store to tell us and thank us for being so kind to her. It’s funny, because she had been so kind to me sharing her stories. She was fabulous. I miss her. The original facade of the Brown Derby on Vine (south of Hollywood, adjacent to the Taft Building) is still standing. While new businesses & lofts were being constructed all over the area (including the property that TBD stood on), the facade remained standing, hidden behind scaffolding. When construction was complete, the facade was revealed and had gotten a facelift. You can see it on Google Maps using “street view”. It looks like some of the arches have been changed to accommodate entrances to current businesses, but the shape, windows, and the decorative elements are still there. I have a picture of my mom and dad, along with his brother and his wife at the Wiltshire brown derby a month before I was born in Jan 1945. The interiors were a set on the Desilu stage. Was the episode of Lucy, Fred, and Ethel real? We’re they actually there or was it a set? Sift together flour, sugar, baking powder and salt into bowl. Make a well in center and add water, oil, egg yolks, grapefruit juice, and lemon peel. Beat until very smooth. Beat egg whites with cream of tartar until stiff but not dry. Gradually pour egg yolk mixture over egg whites and fold in gently until just blended. Do not stir. Turn batter into ungreased 9 inch spring form pan and bake at 350 degrees 30 minutes, or until top springs back when touched lightly with finger. Invert onto rack and cool thoroughly. Loosen edges of cake carefully and remove cake from pan. With serrated knife cut cake crosswise to make 2 layers. Reserve a few fruit sections for frosting. Fill with part of Cream Cheese Frosting and grapefruit sections. Spread top and sides with frosting and decorate with additional fruit sections or small fresh flowers if desired. Soften cream cheese at room temperature. Beat until fluffy. Add lemon juice and peel. Gradually blend in sugar and beat until well blended. Stir in food color. Crush enough grapefruit sections to measure 2 teaspoons and blend into frosting. Note: For a thicker frosting and filling, recipe may be doubled. I have a large black & white photo of the Derby, I went once with my parents… back in the day. Great site! We lived in s. calif. circa 1959-61 or so, I think I left my heart there, because I have been haunted by the place ever since. I auditioned for the Art Linkletter “Kids” show, but as I was almost mute at the time, wasn’t chosen. I still have the photo of me that his son Jack took. I met Lucy & Desi, and also remember seeing Jay North “Dennis The Menace” in a red convertible at the Hollywood Xmas Parade. 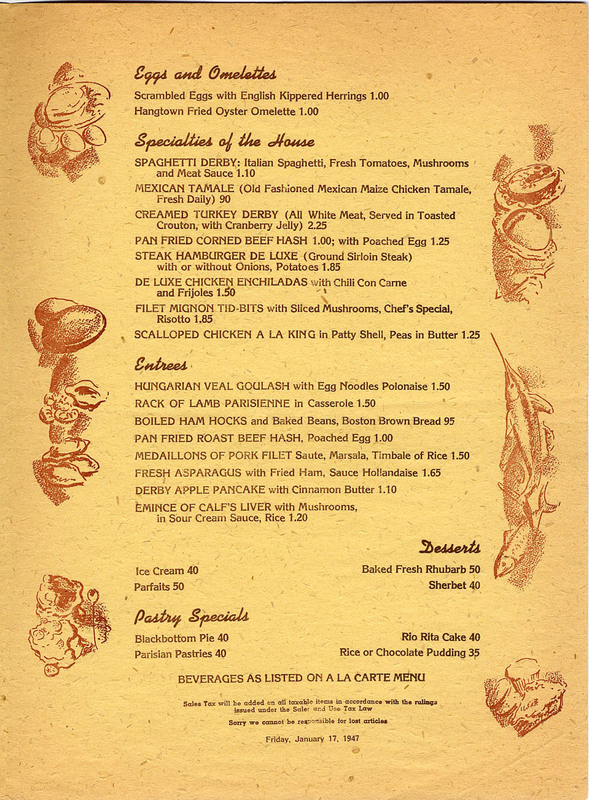 I have a 1950s menu from The Brown Derby, if you’d like me to send you an image of it, let me know. Thanks for the great site. Frank. yes, this IS the brown derby that inspired the song by the cherry poppin daddys, it wasn’t just a random brown derby hat, it was an LA/Hollywood Icon….. I wonder what happened to the famous caricatures that lined the walls of the original location? I love the site. I have always wanted to see what old hollywood sites looked like.Wish other sites had this much info. I used to be a regular at the Vine location. My boss liked to go there for lunch. The Society of Motion Picture & Television Engineers used to meet there. When family came into town, we would eat there. We had dinner there on Thursday, and the waiters were friendly as I was a regular. The next night it was on the news that they were closing that night. No one said anything while we were there the night before. I used to love the Brown Derby Cobb Salad—there was nothing like. Today a lot of restaurants claim they have the original recipe, but, if they do, they don’t use it. The only place in town that makes it like the original is Hillcrest Country Club—at least they did the last time I was there. During its first four years the original Little Hat Derby added only two items to its menu—Cobb Salad and Grapefruit Cake. Bob Cobb was growing weary of the steady hot-dog-hamburger diet. He found an avocado in the ”icebox;” chopped it up, along with some lettuce, celery and tomatoes, plus a strip of bacon and some salad dressing, and had that for his dinner. Several days later he tried it again, adding other ingredients—breast of turkey, chives, hard-boiled egg, watercress, and a wedge of Roquefort cheese for the dressing. Everything was finely chopped. Finely chop the lettuce, watercress, chicory and romaine, and arrange in a wooden salad bowl. Cut the tomatoes in half, remove seeds, dice finely and arrange in a strip across the salad. Dice the turkey meat and arrange over top of chopped greens. Chop the bacon finely and sprinkle over the salad. Cut the avocado into small pieces and arrange around the edge of the salad. Decorate the salad by sprinkling over the top the chopped eggs, chopped chives and grated cheese. Just before serving, mix the salad thoroughly with Original Cobb Dressing. This is the French dressing which became so popular with the Stars. The cup of water is optional, depending upon the degree of oiliness or thickness desired in this dressing. Blend together all the ingredients except oils. Add olive and salad oils and mix well again. Chill well and shake before serving. Some people couldn’t get enough of the Roquefort cheese. This was the roaring ‘20’s and many people had never tasted anything quite like this, so they either loved it or hated it. One day Gloria Swanson heard that someone didn’t want their blue-veined cheese. “What a waste,” she declared. Not wanting to waste anything, she had the waiter blend it into in her salad dressing before it was poured over her Cobb Salad. From that day on there were two choices of dressing—with and without. There used to be a coffee shop sized Brown Derby on Vine St. just south of Sunset…it was right next to my favorite 1940’s throwback bar, the Firefly. When I was ten, I was chosen to appear on Art Linkletter’s House Party. One of the day’s treats was lunch at the Brown Derby. I remember a cart on rollers that served as a traveling milkshake and dessert station, and something called a Luscious Lulu Burger. Pretty heady stuff! Over a decade ago I visited the Brown Derby in Florida. I innocently asked the waitress if they had grapefruit cake. She looked at me in surprise & said, “Of course we do.” Tasted pretty much like the one I remembered years ago in Hollywood.